Miami - June 16, 2009 - Royal Caribbean Cruises Ltd. is proud to announce that it has received the first ever "Clean Sea Award." The award was announced at the Clean Shipping Awards ceremony held during the Nor-Shipping Conference (Oslo, June 9-12), presented in cooperation with Det Norske Veritas (DNV). In total, 60 companies were considered for the various awards and winners were selected by an independent jury. Royal Caribbean won the award in recognition of its superior efforts to limit discharges from ship to sea. In 1992, Royal Caribbean established the widely renowned Save The Waves® program, to ensure crew and guests are directly engaged in our environmental management efforts. Royal Caribbean International's Oasis of the Seas, which launches at the end of the year and with a passenger capacity of 8,400, will have a higher standard of waste treatment than that of the most stringent global guidelines. "Royal Caribbean is honored to be recognized for our efforts to minimize our environmental footprint, contribute to conservation and set new standards of environmental stewardship in the shipping industry," said Jamie Sweeting, vice president of Environmental Stewardship and Global Chief Environmental Officer for Royal Caribbean Cruises Ltd. "As an industry we have a special responsibility to protect our marine ecosystems, because clean waters are good for the environment, good for our guests and good for our business." The launch of the Clean Shipping Awards corresponded with this year's Nor-Shipping Opening Conference titled "From Crisis to Opportunity: Shipping's Role in the Fight against Climate Change". The conference brought together leading industry voices representing ship owners, cargo owners and regulators to discuss climate change. During the opening conference, Richard D. Fain, chairman and chief executive officer of Royal Caribbean Cruises Ltd., spoke on the importance of making sure governments, consumers and other industries around the world understand the shipping industry is concerned about climate change and playing its part to minimize its greenhouse gas footprint. "The Norwegian shipping industry is internationally recognized for being a pioneer in the development of solutions and technologies to manage a broad range of environmental issues," said Tollef Schieander, director of Nor-Shipping. "The Clean Shipping Awards will serve to support these efforts and reward any company with the vision and expertise to develop good environmental solutions." Royal Caribbean Cruises Ltd. is a global cruise vacation company that operates Royal Caribbean International, Celebrity Cruises, Pullmantur, Azamara Cruises and CDF Croisieres de France. The company has a combined total of 38 ships in service and six under construction. It also offers unique land-tour vacations in Alaska, Asia, Australia/New Zealand, Canada, Dubai, Europe and South America. MIAMI, July 31, 2007 - From the bustling Colombian city streets to the pristine beaches of the ABC islands, Royal Caribbean International guests can now experience a perfect blend of Southern Caribbean life while cruising from Colón, Panama. Marking the first time that the cruise line has established a homeport at the mouth of the Panama Canal, Royal Caribbean today announced 17 sailings from December 2008 through April 2009 aboard Enchantment of the Seas. 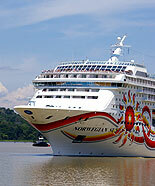 The seven-night voyages will visit spectacular ports-of-call in Colombia and the Dutch Antilles. "Colón is a spectacular Central American city and sailing from Panama not only offers our guests an exciting itinerary, but also allows more travelers more convenient opportunities to enjoy a Royal Caribbean cruise," said Adam Goldstein, president, Royal Caribbean International, at a press conference in Panama yesterday. "We are pleased to bring our signature style of cruising to Panama as we extend our brand globally, and we thank the government for their enthusiastic support." Ports of call on Enchantment's Southern Caribbean cruises from Colón include Cartagena and Santa Marta, Colombia; Aruba; Bonaire and Curacao. Travelers also can choose from two eight-night repositioning voyages aboard Enchantment sailing on November 29, 2008 and April 5, 2009. In addition to visiting Santa Marta and Cartagena, Colombia, guests will enjoy two more days in the Caribbean Sea and a call at Puerto Limon, Costa Rica, as the ship cruises to and from Colón and Fort Lauderdale, Florida. "Our 2007-08 itineraries from Santo Domingo on Legend of the Seas and from Brazil on Splendour of the Seas have been exceptionally well-received and we are thrilled to further expand our offerings in Latin America with Enchantment's Southern Caribbean cruises," said Maria Sastre, vice president, international sales and marketing, Latin America, the Caribbean and Mexico. "Royal Caribbean's expansion into Panama further demonstrates our continued focus on developing our business in Latin America." On Enchantment of the Seas, guests will enjoy non-stop entertainment and endless options for families and active travelers as they sail to some of the 'must-see' destinations in the Caribbean. At each port of call, a great variety of shore excursion opportunities - including historical site visits, off-road adventures, shipwreck diving, zip lining through forest canopies and whitewater rafting - are offered to further enhance the cruising experience. Enchantment of the Seas features a solarium covered by a crystal canopy, a glass roof that retracts to take advantage of the tropical Caribbean weather. Guests can relax by three pools and in six whirlpools, while kids frolic in their own splash pool and interactive play area. The more active vacationers can try a bungee trampoline or work up a sweat at the rock-climbing wall or jogging track. The Enchantment Fitness Center and Day Spa features extensive fitness programs and a world- class spa menu. The line's award-winning Adventure Ocean youth program, with five age-tiered curricula, entertains and enlightens younger guests under the age of 18. Royal Caribbean is the only major cruise line with dedicated teen spaces aboard every ship in its fleet and on Enchantment, the Fuel teen-only hang-out and disco are perfect settings for teens to meet and relax with peers. Guests can enjoy casual to fine dining in three restaurants, including Royal Caribbean's signature Chops Grille steakhouse. In the evenings, there is non-stop entertainment in eight lounges, including the Latin-themed Boleros, and there are top-rated Broadway-style performances in the Orpheum Theatre, or gaming action at the Casino Royale. Providing the line's signature Gold Anchor Service, Royal Caribbean's friendly and engaging staff and crew help make each guest's cruise vacation a unique and unforgettable experience. Royal Caribbean International is a global cruise brand with 21 ships currently in service and three under construction. The line also offers unique land-tour vacations in Alaska, Asia, Australia, Canada, Europe, South America and New Zealand through its cruisetour division. Fore more Press Releases from Royal Caribbean see their website here.